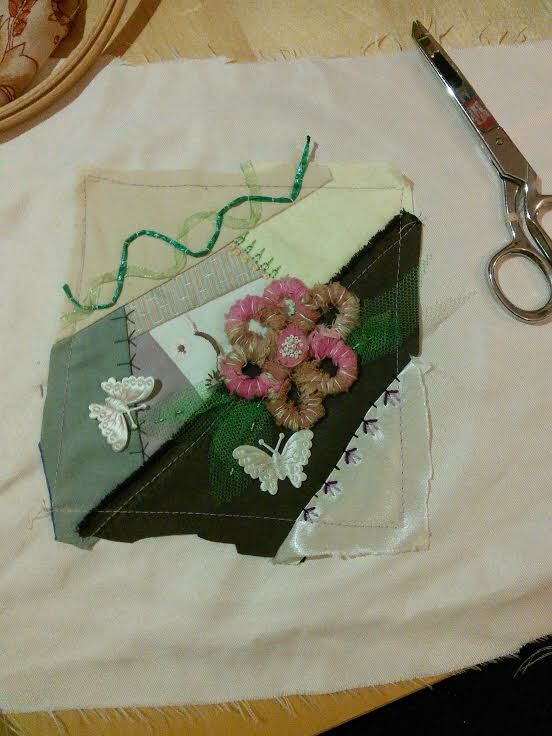 The piecing was done at home, and the stitching both on the bus, on lunch breaks, and at home. Years ago, I took an on-line class from Sharon B of Pintangle fame; this is so long ago that she's not even doing the class anymore. It was too much for me back then and I didn't get further than reading the handouts, but as my new year's resolution, I decided to start a crazy quilt this July. I skimmed through those handouts and started sewing. The good: I like how it looks. The bad: Lots of anxiety around choosing how to put it together, though none of it was difficult. The ugly: It's not as fancy as I had in mind; it feels done, but I feel like I kept deciding not to add stuff. Now, time to start the second block.